Opening weekend $23.387 million on 2621 screens. If I needed to choose the Worst Trailer Ever, I might select the teaser for 1997�s Face/Off. Rarely have I seen a clip that so severely turned me off on a flick. My then-girlfriend still wanted to see it, though, and she essentially convinced me to do so as well. Man, did I feel happy she did! Despite that atrocious promo, the movie itself turned out to be simply thrilling and exciting. More than five years after that initial screening, I can�t say that Face/Off still rocks me like it did in 1997, but the movie continues to provide a cool experience. Face/Off starts with a prologue set about six years prior to the main events. We see arch-criminal Castor Troy (Nicolas Cage) shoot law enforcement agent Sean Archer (John Travolta). Archer escapes with a superficial wound, but the bullet passes through him and kills his young son Mike. Once we come to �present day�, we find that Archer continued on Castor�s trail for that entire period. After a violent sequence, Archer apprehends Castor�s techie brother Pollux (Alessandro Nivola) after the apparent death of Castor. With Pollux in custody, Archer attempts to find the location of a nasty biological weapon planted somewhere in Los Angeles. Pollux won�t spill the beans, so authorities offer an unorthodox solution. It turns out that the accident didn�t kill Castor after all; he remains comatose but alive. Dr. Malcolm Walsh (Colm Feore) states that he can swap faces between Castor and Archer and allow the latter to perfectly impersonate the former. Reluctantly, Archer agrees to do this, so he enters Erehwon Prison to cozy up to Pollux. After some missteps, this succeeds, but in the meantime, the real Castor snaps back to life. Understandably cheesed by the absence of his face, he forces Walsh to turn him into Archer. 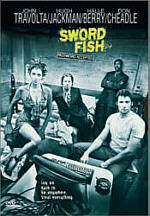 Castor then kills Walsh and all of Archer�s cronies who know of the secret mission. Firmly in place as Archer, Castor takes over his life. That means he fools Archer�s wife Eve (Joan Allen) and sullen teen daughter Jamie (Dominique Swain). In Archer�s guise, he stages many events that elevate his status in his agency and make him a new star. The real Archer, however, has to execute an escape from Erehwon so he can reclaim his old life and recapture the real Castor. Movies often stretch what we�ll accept from technology, but Face/Off pushes the limits to the extreme. However, even as absurd as the concept of face switching may sound, the film actually makes it almost sound plausible. After some brief moments of wariness, the topic becomes a non-issue quickly, and it never really distracts from the rest of the flick. This happens because director John Woo pulls off such great action. He brings a terrific sense of style to the material and moves things at a brisk pace. 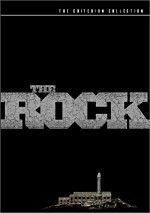 Woo still allots enough time for character development to make the flick work, but the action makes it something special. In addition, excellent performances help elevate what should have been a silly movie. Travolta and Cage manage to swap personalities but not parody the others. Travolta probably emulates Cage better than the other way around, but he does get the easier role. Castor�s such a cartoonish figure that Travolta doesn�t have to deal with the same level of nuance. Cage reins in his naturally extravagant tendencies to capture the anguished heart of Archer as well as the crude magnetism of Castor. Not only do both leads do extremely well in dual roles, but also the supporting performers add depth to the piece. Allen helps anchor the flick with her accurate view of Eve, and Nivola turns a small and caricatured role into something quite memorable. He allows Pollux to be amusing and compelling far beyond the scope of the scripted character. Parts of Face/Off really do seem cheesy, especially due to some artificial and stilted dialogue. However, the combination of elegant style and excellent performances make it a genuine winner. The movie also packs a much more substantial emotional punch than the average action film. I don�t know if I can consider Face/Off to be a true classic, but it remains a terrific piece of work. 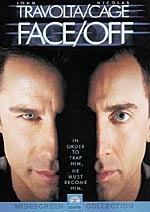 Face/Off appears in an aspect ratio of approximately 2.35:1 on this single-sided, double-layered DVD; the image has been enhanced for 16X9 televisions. One of the very first DVDs to emerge from Paramount in 1998, much of Face/Off looked quite good, but it demonstrated many more flaws than I�d like. Sharpness appeared terrific. The movie consistently came across as crisp and distinct, and I noticed no issues related to softness. The film seemed detailed and accurate. However, I did detect some jagged edges and shimmering, and occasional examples of prominent edge enhancement occurred. Print flaws also caused some issues. I discerned periodic examples of specks, grit, scratches, blotches and grain. The movie seemed surprisingly dirty given its recent vintage. At times, the colors looked a little dense, but they usually appeared positive. The hues generally came across as clean and vivid. Only occasional sequences displayed moderate muddiness. Black levels were tight and deep, but shadow detail seemed somewhat thick at times. Much of Face/Off presented very positive visuals, but the various concerns seemed significant enough for me to drop my grade down to a �C+�. The Dolby Digital 5.1 soundtrack of Face/Off also showed many strengths but displayed too many problems for a modern flick. The soundfield generally was solid. Music showed good stereo imaging, while effects appeared reasonably well placed and involving. At times the material lacked the greatest sense of placement or delineation, but the elements generally blended well and moved accurately. The surrounds contributed a lot of unique information, especially during the many action sequences. All five channels received a great workout. Audio quality lagged at times, unfortunately. Speech always remained intelligible, but the lines occasionally sounded somewhat muffled and flat. Music was reasonably bright and vivid, and the score showed reasonable depth and dynamics. Effects came across as problematic at times. Those elements displayed moderate distortion at times and generally were a bit rough. For example, the fight sequence in the prison cafeteria sounded notably edgier than I�d like. Bass response appeared loud but lacked great definition; low-end seemed good but a bit loose. Ultimately, much of Face/Off sounded positive, but the track lacked the clarity and precision I expect of a modern flick. Face/Off includes almost no extras. We simply find the movie�s theatrical trailer. Presented non-anamorphic 1.85:1 with Dolby Surround 2.0 audio, this shows parts of the teaser trailer that originally turned me off on the film. One of the best action flicks in recent years, Face/Off easily could have turned silly. 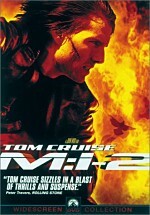 However, the movie melds excellent action with vivid performances to become something special. Unfortunately, the DVD displays flawed and erratic picture and sound plus virtually no supplements. As much as I like it, I can�t recommend Face/Off to anyone who doesn�t already love the film � the DVD simply seems too flawed.